Tamashii Nations is celebrating My Melody's 40th anniversary by bringing you My Melody as you have never seen her before! Welcome My Melody in Chogokin-style as an adorable die-cast metal robot! Chogokin My Melody can change from standing to flying mode and can also shoot a heart missile from her ear. She even comes with a miniature My Melody pilot figure! The set also includes a special Chogokin display stand and two support pieces for the flying mode. 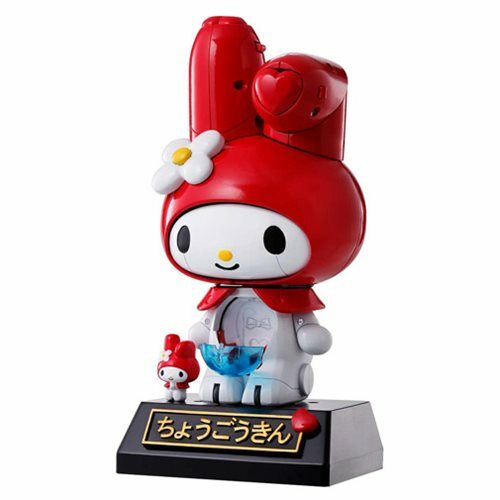 Don't miss out on this delightful Chogokin x Sanrio collaboration item! Ages 15 and up.